“Abraham Lincoln: Vampire Hunter” is the first in what will no doubt be a long and exhaustive trek across the cinematic landscape of well-known historical and literary figures coming to blows with the movie monsters made famous in the golden age of Hollywood. Based on a popular book of the same name, it sets an example now widely embraced by fiction readers of this generation, in which characters from famous stories like “Sense and Sensibility” do battle with sea monsters, or the heroine of “Pride and Prejudice” is caught in a world of zombies. In some meandering way, I suppose, this marriage of genres is a clever gimmick on part of skilled writers wanting to lure aspiring bookworms into the practice of developing knowledge of the classics of literature outside of educational curriculums. Such a ploy is shrewd on their part, but effective for an audience of novices that are easily hooked by the supernatural sensibilities of modern art. I applaud the chutzpah, really. 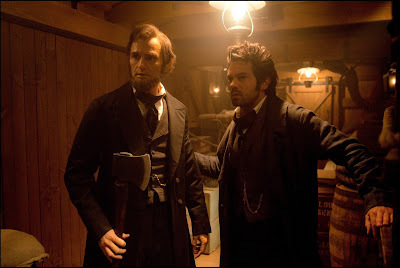 Alas, if the movies are to learn anything from that enthusiasm, than this adaptation of “Abraham Lincoln: Vampire Hunter” does not provide a very noteworthy lesson. It tells an intriguing story of a well-known American figure, whose life is apparently punctuated by a series of unfortunate life circumstances that deal with ravenous bloodsuckers, and how they ultimately shape him through on the National stage during the country’s Civil War. In a context that would offer great fun at the expense of shameless historical revisionism, this could be one heck of a thrill ride for eager movie audiences. But the movie does not realize its distinctive measures, and sabotages the scope of the material for no purpose other than to drag the screenplay through the same tired and pedestrian clichés we come to expect of traditional mainstream blockbusters. Somehow, you can’t help but feel vampires deserve better. The movie stars Benjamin Walker in the title role, a man whose crux of individualism seems to emerge, both fictionally and historically, from the same interior desire: for all men and women to share prosperous lives. What fuels him through the course of this narrative originates from a grim circumstance he is exposed to at an early age, when his mother is murdered by the ruthless plantation owner Jack Barts (Marton Csokas). In a moment of grief, little Abe vows to avenge his mother and track down her predator to exact certain revenge. Ah, but what he does not anticipate when the time comes for a planned ambush is the truth slapping him in the face: Barts is actually a ruthless vampire, and Lincoln is ill-equipped to handle him in any violent capacity. Enter Henry Sturges (Dominic Cooper), an enigmatic bloke, who stumbles upon the two engaged in an imbalanced confrontation just in time to save Abe’s life. Once recovered from the predicament, Henry reveals details in a grisly national history that has shaped the conditions in which both men meet. He is a vampire hunter, struggling to keep a secret society of blood-thirsty monsters from overwhelming the American populace, and the only way he can maintain that pattern is by training agile men carrying weapons of silver in the fine art of fighting and killing vampires. Naturally, Abe is recruited by Henry to become the next of his hunters, and it involves a persuasive sales pitch that even 19th century inventors could have learned from. The premise projects a certain audacity into its details. Here, vampires don’t merely exist in this world in isolated clusters; rather, they are fully organized in the south, and will fight with the Confederacy to overthrow the democracy. Why? Because they no longer want to hide in the shadows, I suppose; plus, if the laws of the evolution were to be echoed in society, then vampires are clearly higher on the food chain than normal human beings. Their secondary motivation is even slimier: they indirectly support the oppression of blacks because slaves provide ample food supply to the vampires, and heck, why indeed would they want to give up that luxury? The film is fortunate not to exploit this suggestion much further than just a couple of casual references. I dread, however, how a filmmaker might observe these details if the vampires were dislodged into the era of, say, Nazi Germany. The lead vampires are Adam (Rufus Sewell) and Vadoma (Erin Wasson), siblings who, based on notable interactions, we suspect are hiding more secrets than just their identities. Adam is sly but determined in his conviction to overthrow the North’s revolt against their kind; he faces his would-be killers with passive reverence, and yet always seems one step ahead of their agendas. That creates tension on both sides at critical junctures of the story. When the knowledge of vampires reaches the general populace, they are slaughtered mercilessly in a critical civil war battle where, at the last minute, all participants realize how ineffectual traditional weapons are against such undead. Lincoln then orders the collection of all silver materials nationwide to be smelted for more balanced warfare, and Adam gets wind of this plot just as the materials are being transported on the railroad. Care to take a guess at what happens next? What this all does, in any case, is set the stage for a series of plot points that act as nails in a coffin designed to smother the movie’s core intentions. There is no glee or joy in any of the actors – not even Dominic Cooper, who projects so much confidence and irony in his performance of Sturges that we almost wish it were in a movie more deserving of the portrayal. Ditto to Sewell, who has a few great lines here (“Men have enslaved each other since they invented gods to forgive them for doing it”) but is sentenced to the typical growls and shouts implored by movie vampires since the very beginning. And Walker, who is familiar with this kind of story based on his stage work in “Bloody Bloody Andrew Jackson,” barely sleepwalks through the material as Abe, and his interactions with key characters feel like those one-on-one rehearsals done by drama teachers in high school to help new actors loosen up in the company of colleagues. There is one particular fit of anger that puzzles me: when Abe learns of Henry’s true identity, there is a reactionary outburst, and then an immediate decision on Abe’s part to walk away from his secret life as a slayer. What for? Minus the knee-jerk sentiment, Henry’s situation really does make perfect sense: if you are undead and cannot kill your own, and you are seeking revenge for the death of your own wife at the hands of the ones you can’t touch, of course you are going to recruit living beings to do the work for you. Couldn’t Honest Abe even see that before flying off the handle? Perhaps Grahame-Smith’s character exists in a vacuum that takes liberty with deluding the personality traits of his source, but I didn’t quite expect this Lincoln to be so… short-sighted, I guess. The visuals are not much better. Fights between vampires and their hunters are executed with precise choreography but are viewed from a camera that undermines them with abrupt cuts. The vampires are ramped up to such overblown exteriors that they look like Halloween costumes, and their dialogue is often reduced to low-brow puns (“Send a fresh crop south; we have a lot of mouths to feed”). And how about that climax? In a sequence that involves a chase across train cars speeding over a wooden railroad trestle set on fire by worrisome vampires, all the key ingredients to a successful and exciting resolution are in place. But they are staged without rhythm, and the scene wraps up so quickly and neatly that it cuts through the bubbling tension established by its devices in order to arrive at a well-groomed conclusion. The movie was written by Seth Grahame-Smith (the novelist who wrote the original novel) and directed by Timur Bekmambetov, both of whom treat the movie screen less like an outlet for expression and more like a box to squeeze a product in. I am amazed at how casual some filmmakers are at clipping the wings of something so eager to fly; one has to almost wonder if they are burdened by an insecurity in these ideas working in motion pictures (was Smith as tense writing the original book as he seems to be in concocting this screenplay?). The truth is that any idea can work in the movies with the right arrangement of tone and style. Furthermore, the adventurous nature of an idea like “Abraham Lincoln: Vampire Hunter” has little risk to offend, and all the room in the world to take liberties with formula and approach. 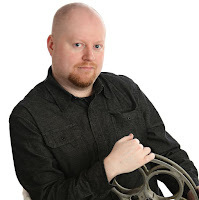 Bekmambetov, who made the intriguing “Night Watch” and “Day Watch” films last decade, is a gifted filmmaker with clear inspiration, and Smith is no doubt just as talented in his primary medium. Here they seem trapped by the curse of the Hollywood machine: the belief that all concepts must bend to the will of a successful studio blueprint, even if the idea has the possibility of exceeding those constraints.